Agrimony is a common herb and a member of the Rosaceae family. It is native to the temperate regions of the Northern Hemisphere and is also found in Africa. There are more than 12 species of Agrimony, the main two being Common Agrimony (Agrimonia eupatoria) found in Europe, and Hairy Agrimony (Agrimonia gryposepala) which is found in North America. This plant can grow from 0.5 – 2m tall and is characterized by its slender spikes of yellow flowers. Its name is derived from the Greek word Argemone which means ‘plant that heals the eye’, referring to its popularity as a remedy for eye and visual ailments. This herb is often also known as liverwort, cocklebur, and sticklewort. 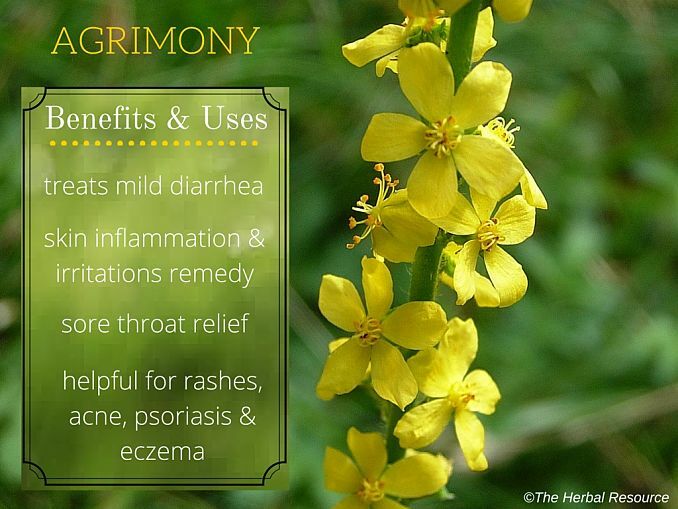 Agrimony is considered a safe herb, but due to its astringent properties, can exacerbate constipation. It is also safe for children to use but pregnant and breastfeeding women should avoid it unless approved by a doctor.